Known for its pious and holy atmosphere, Haridwar in India is the first major town that welcomes River Ganges on the plains. Being one of the seven holiest places of India, Haridwar is a highly revered place by the Hindus. It is called the ‘Gateway to the Gods’ as the Gods are believed to have left their footprints in Haridwar. Haridwar is located in the north Indian state of Uttaranchal at a distance of 214 km from New Delhi, 50 km from Dehradun and 386 km from Agra. It is also one of the major Shaktipeeths (great Hindu learning centre) and the gateway to the pilgrimages in the Uttrakhand region, namely Rishikesh, Badrinath and Kedarnath. Located at the foothills of the Shivaliks at a height of 249.7 meters above sea level, Haridwar covers an area of 2360 sq km. The best time to visit Haridwar is between October and March. The holy ghat of Har-Ki-Pauri or Brahamakund was constructed by King Vikramaditya in memory of his brother Bhatrihari. The ghat is one of the most visited places in Haridwar. One can see the footprints of Lord Hari (Vishnu) in the temple at Har-Ki-Pauri. The ghat boasts of being the most sacred and auspicious point to bathe in the holy river Ganga during the Kumbh and the Ardh Kumbh fairs. This highly revered temple devoted to Goddess Mansa Devi is situated at the top of Bilwa Parwat. Devotees can reach the temple via rope-way cable cars. The temple offers a 3 km wonderful trek from Chandighat. Located on the top of the Neel Parvat, the temple is believed to be built in 1929 by the King of Kashmir, Suchat Singh. The main idol at the temple was established by Adi Shankaracharya in the 8th century. The land of Haridwar is popular as the hub of temples and pilgrimages. The devotees also visit places like Sapt-Rishi Ashram and Sapt-Sarovar, Maya Devi Temple, Daksha Mahadev Temple, Bilkeshwar Mahadev, Pawan Dham, Bhooma Niketan, Vaishnav Devi Temple, Bharat Mata Mandir etc. here. 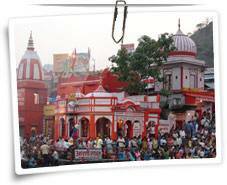 Being an important religious centre, Haridwar hosts festivals throughout the year. Some of the well known fairs are the Kumbh Mela, Kavad Mela, Somvati Amavasya Mela, Ganga Dussehra etc. Kumbh fair is organized once in 12 years when the planet Jupiter (Brahaspati) gets closer to the planet Uranus (the ruling planet of Aquarius/Kumbh). Ardh-Kumbh is held every 6 years. Prayag, Hardwar, Nasik and Ujjain are the four places that host the grand fairs of Kumbh and Ardh-Kumbh. People believe that a holy dip in the river Ganges during these fairs gives Moksha or Nirvana. it is organized just before the festival of Shivratri, when the devotees throng to Haridwar to collect the holy waters of the river Ganga. They carry it back to their hometown and offer it to Lord Shiva on Shivaratri. Haridwar, being a religious place, offers several prayer articles, idols of Gods & Goddesses, books and CDs on spirituality, Yoga and Meditation etc. One can go to the U.P. Handloom Emporium near the Bharat Mata temple to buy handicrafts, shawls, jewellery, beads, artifacts, decorative pieces, etc. Moti Bazaar, Upper Road, Jwalapur and Kankhal are some other shopping areas. This famous tourist destination offers a number of accommodation options categorized into different types like heritage hotels, premium hotels, economy hotels and budget hotels. Most of them also offers a number of business facilities and recreational facilities. By Air: The nearest airport is the Jolly Grant (41 km) in Dehradun. By Train: Haridwar itself is well connected by trains to almost all the major cities in India. By Road: The city lies on National Highway - 45 . Therefore, it is easily accessible by road as well. One can reach Haridwar by state transport buses, deluxe buses or taxis from Dehradun, Delhi, Nainital, Agra or several other major cities.